Yesterday I paused to contemplate my many blessings. And compared with others, there is a lot to be grateful for. I started my holidays today. Well, my real holidays started today but I had an admin day off work first without the kids. And yesterday morning I volunteered for two hours with my friend Kylie Travers from Aspiring Millionaire at the Kippax Uniting Church, helping to hand out Christmas hampers as part of the ‘Let’s Give Everyone a Christmas‘ campaign. I have always wanted to do something proactive at Christmas, but had never really gotten around to it. On my ‘to do’ list. I mean, I usually give some money but don’t usually do much hands on stuff beyond expressing gratitude to family and friends. You hear about people who are struggling, usually through those heart wrenching stories written by charities seeking donations. But by and large the ‘poor’ are nameless and faceless. But yesterday, I came face to face with people in my community who are doing things tough. A beautifully well-behaved, articulate and intelligent young lady of seven, who waited patiently while her Mum went in to choose Christmas presents. If you didn’t know better, you would think the girl was from an exclusive private school On the way out, her Mum said she owed over $1,000 in utilities and would have otherwise faced a bleak Christmas. A mother with young children who had until recently been homeless after a domestic violence situation. She just wanted to talk and talk and talk, and I sensed that in many ways the process of coming to collect the items was more about connecting with people. It can be isolating when you are at home all day with young children and don’t have much money to be able to go out. We were a similar age and had a child also the same age; her change in circumstances had come quickly and unexpectedly after nearly twenty years of marriage. Another single mother of four children, who drove literally across town said she would have come earlier except she couldn’t pay for petrol. She worried about whether her kids would like the presents that she chose; two had special needs. Some of my friends know that I have had a tough year in 2014; there have been times of extreme emotional lows and stress about financial uncertainty. It has been touch and go for me sometimes. But today I was humbled. How can I complain, when things could be so much worse? My kids have presents to open on Christmas day, our fridge is full of food, I have family who loves and cares for me, I can pay all my bills on time (even if just), and I have good health. I am truly blessed. Ms Frugal Ears note: I have recently started taking my kids to the Kippax Uniting Church, and have felt embraced and welcomed by the community. 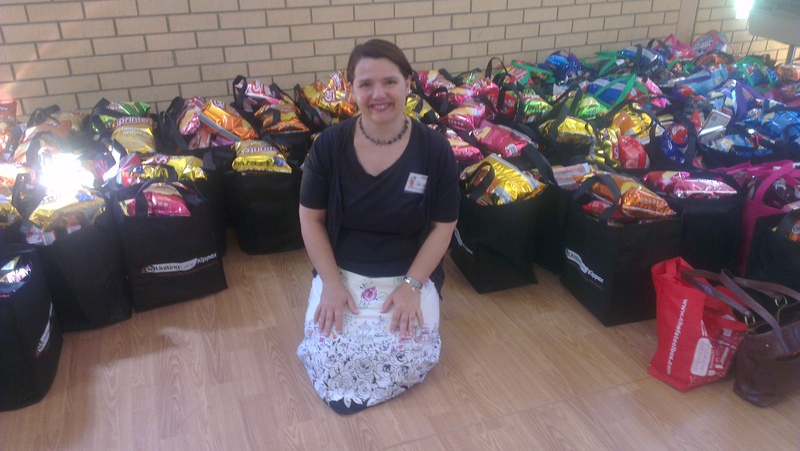 I have had only a minimal role in their Christmas hamper program, but what I have witnessed has impressed me very much. 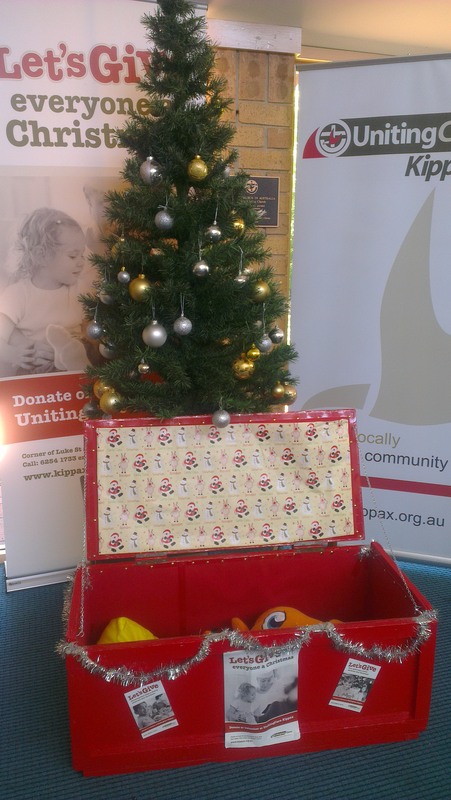 The recipients can choose Christmas presents, and receive a box of grocery items, a bag of other grocery items, and (depending on availability) a frozen chook. If you would like to contribute to the Let’s Give Everyone a Christmas campaign, see details here. Thank you Marg for sharing. I was really very touched by this experience. I hadn’t had such a good year myself, and it would have been easy to whinge about it. Coming face to face with lovely, ordinary people who just were going through really bad financial times made me realise how lucky I was.